Replied by Ty_Eeberfest on topic Mystery Nixie? Desk Clock? I don't think anybody cares if we take the thread off topic, especially since the OP has not been here in years. 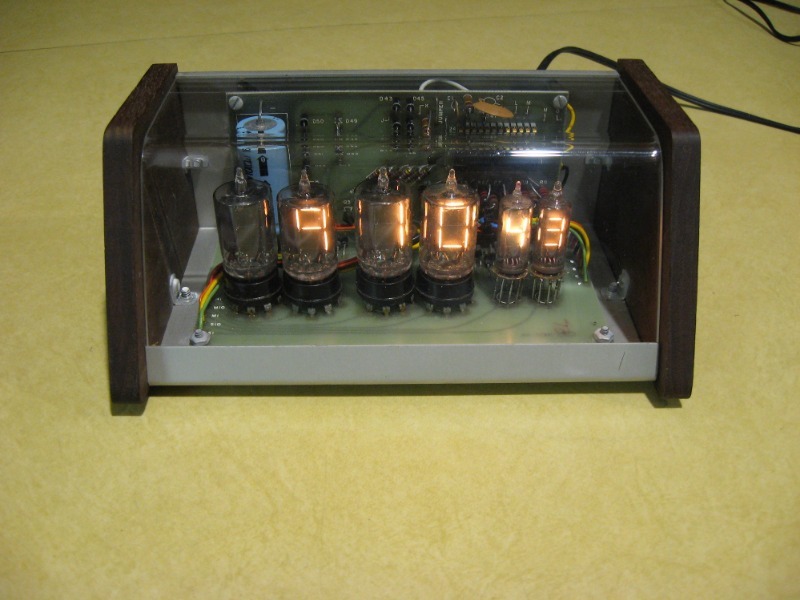 The clock kit was made and sold by IC Electronics in Orange, CA. IC was a small single location parts distributor / retailer that seemed to specialize in supplying small lots of hard to find (at the time) components to people developing prototypes. Plus a little bit of surplus stuff (like those 60 cent B-7971s). The owner made up some boards and sold them with a bag o' parts from his stock as a clock kit. Basic MM5314 + LED displays design. I doubt more than a couple dozen were ever sold. I found your YouTube channel and looked at a bunch of your videos. You have an interesting collection of old equipment. The TTL clock looks great! Very clean job on the circuit boards. Nice to see you made the effort to work out your own circuit design instead of just duplicating some app note schematic. Look into it later when the dust is clearing off the crater. Replied by JIMO on topic Mystery Nixie? Desk Clock? Thank you for the complements. I have to say, I did alot of poking around on the net for help. The data book was also a help, which I happen to have from school days. (1992 or so). The 1 to 12 counter was a huge hurtle. The 7490 resets to zero and I could not figure put how to trick it to jump to one with the whacky 0-9 and 1-2 count needed for the hours position. So I used flip flops because I found info on someone doing this. But it did not work, I did make changes and figured it out. The time setting is my own doing and using button debouncing techniques. I learned alot on this project last year. The mechanical equipment in my videos was my passion for years but I now have physical limitations which is why I swayed to clocks. Just dealing with bad carpal tunnel right now so I am slowed with that. It is easier to repair old production clocks than build from scratch right now. To finish this story, I did find another example of the same clock that the original poster had started this thread with. It has an early MM5314N with a 1972 date code with gold pins and 1973 dated RCA tubes. Replied by jonboy on topic Mystery Nixie? Desk Clock? Numitrons are on the list for me to build a clock out of one day. I think they look very cool. I notice in the picture the second numitrons are smaller than the minutes and hours, do you know what the make of each are?